garlands. I had a go at building my own mori wish list... with a few little extras of course, for good measure! 1. Deer framed print, The Range - this framed print is so beautiful, I love the soft, muted colours and watercolour deer. It is 30cm x 30cm in size and only £8.99, the Range has such great deals and in store it's even better, I picked up this beautiful wall plaque in store for a tenner and it ended up being £6.99 on the receipt. 2. Faux fur cushion cover, H&M - mmm this cushion cover is dreamy and looks seriously soft and fluffy for winter time! I tend to buy cushion fillers in bulk and then end up with not enough cases for them! I think it would soften up the darker pieces on my wishlist and the different textures would look so pretty together. 3. Deer metal hook, H&M - you will probably start to notice a woodland creature theme emerging here on my wishlist but I'm really in to deer everything at the moment haha, this is such a cute take on the traditional hook, I would have many dotted about the home, hoisting up snow dusted coats or used as curtain hooks. 4. Hiver pie dish, Anthropologie - I have never seen such a beautiful dish before! This piece gets me so excited for the festive season and I'm tempted to save up for this, just so I can have it in the centre of my table in my photos come the festive season. I reckon you could also get away with having it out all year round! 5. Dreamy wooden accents, Cheshire Mouldings - the first step to creating a mori like home is creating a light, cosy backdrop and incorporating lots of natural textures, wooden flooring/staircase (think fairytale cottage, hobbit home vibes) that you can then layer with lots of dreamy decor. 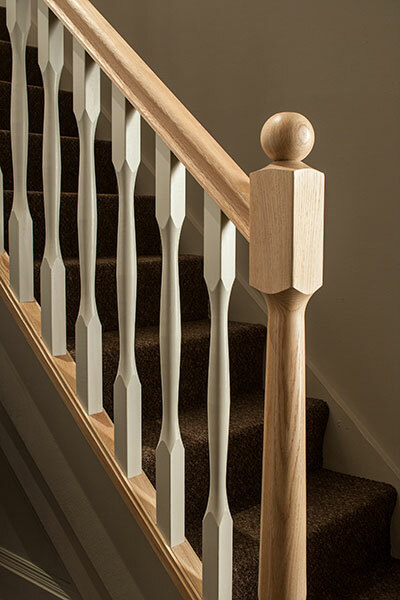 I love this cute acorn design, I would choose pine wood against white primed spindles similar to this staircase, along with this shade of paint, ahhh! 6. Large resin wicker basket, TK Maxx - this is the perfect storage solution for a mori style home, whether you are looking to store endless amounts of toys, Christmas decorations, rugs, cushions, bits, bobs or fire wood. 7. Lush Bunny Moon mask - there are two particular Lush items I've been longing to try lately so I couldn't resist squeezing them on to my wishlist. First up is this face mask with the cutest name. It's said to be lovely for sensitive skin and I am still yet to try a Lush mask, despite adding one to my wishlist last autumn! 8. Pine cone heart wreath, The White Company - this is the wreath of my dreams, I love that you can use it all year round, with it being heart shaped. It's the perfect addition to any front door and I love how everything from the White Company feels so luxurious, I've been poring over their White Christmas set ups. 9. Lush Sleepy lotion - I've heard so many good things about this body lotion, it sounds perfect for an evening of unwinding and to get you in a sleepy mood not that I need that. I managed to smell it in store and it reminds me of the 'Twilight' fragrance, my favourite fragrance from Lush as it's so calming! 12. Welcome to our nest print, Etsy - such a sweet print that tunes in nicely with my woodland animal theme, I love the 'Welcome to our Nest caption'. This is a downloadable print out but you can also order the print to your door for about £11. It would be so cute in a nursery or living room and exudes shabby chic vibes. 13. Long soft toy cushion, H&M - I really need to festoon my sofa with one of these, just because. Sometimes you just need a huge long fluffy bunny snake curled around you on a cold day. Oh my gosh, everything is so so cute! I love the bunny cushion! That little bunny cushion is so cute! Need it in my life! Love the faux fur cushion! Nice selection darling, so lovely items! Ah, I love that rabbit cushion. I had no idea H&M had such cute decor! What a gorgeous wish-list! As always, what a stunning post! I love the H&M bits, they always nail it! This is definitely my style of inspiration! So pretty with all the soft colours and cute designs. 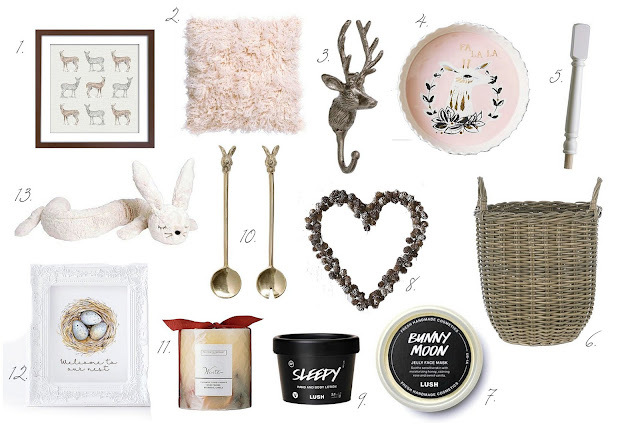 You always create beautiful wishlists, and this one is no exception - my favourite thing is the deer metal hook!